Monthly general meeting. All GSAS students are welcome to attend! Come celebrate the end of a successful academic year! Event co-hosted by GSAS, GBS, and GESC. Food by Firefly. Featuring Dr. Noelle Hurd, Dr. Rose Buckelew, Dr. Sebastian Tello-Trillo, and Dr. Eyleen Jorgelina O’Rourke. Coffee, Donuts, and Bagel Break! Take a break from work on Thurs. Dec 13th with coffee, donuts, and bagels from Honor Council and GSASC! Goes from 10am until supplies run out. Check our Facebook for your departments location! Join GSASC for hot apple cider, tea, and sweet treats before heading over to enjoy the Lighting of the Lawn ceremony! General body meeting for the month of September. All GSAS students are welcome to attend! Remarks by James Ryan, President, Allen Groves, Dean of Students, Leeza Constantoulakis, Chair of Graduate and Professional Council, and Ory Streeter, Chair of University Honor Committee. Followed by BBQ at the Amphitheater. Join Grad Council, GBS, Curry, DSI, and GESC at Champion Brewery to celebrate the end of the Spring semester and 2017-2018 academic year! Join Grad Council for our monthly general body meeting. As part of our 2017-2018 Leadership Speaker Series, we'll be joined by the Dean of the UVA School of Law, Risa Goluboff. We'll also hear from three of our first annual GSASC grant winners, Kal Munis, Monica Blair, and Allison Cobb about their current research projects. Free food provided! Join Grad Council for our monthly general body meeting. Join Grad Council for our monthly General Body Meeting. As part of our 2017-2018 Leadership Speaker Series, we'll be joined by the Vice Provost for Academic Affairs, Archie Holmes. We'll also hear from three of our first annual GSASC grant winners, Nicholas Jacobs, Andrea Pauw, and Vivien Chang about their current research projects. Free food provided! 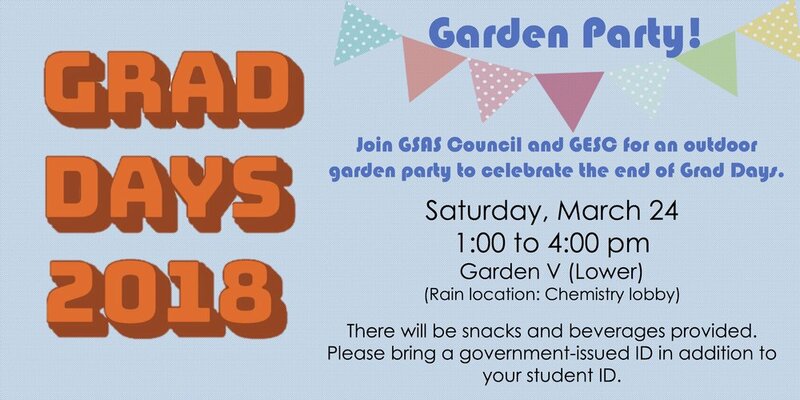 Join us for a Garden Party in Garden V on the Lawn as we wrap up GradDays 2018 with free food (catered by Mezeh), drinks*, and celebration! Grad Council is hosting a panel of UVA LGBTQ faculty and staff from various disciplines, departments, and offices for a lunchtime discussion to discuss their personal experiences and any obstacles they've faced navigating academia and the job market. After a brief introduction of speakers and prepared questions from a moderator, we will open the room for a series of informal questions and conversation. 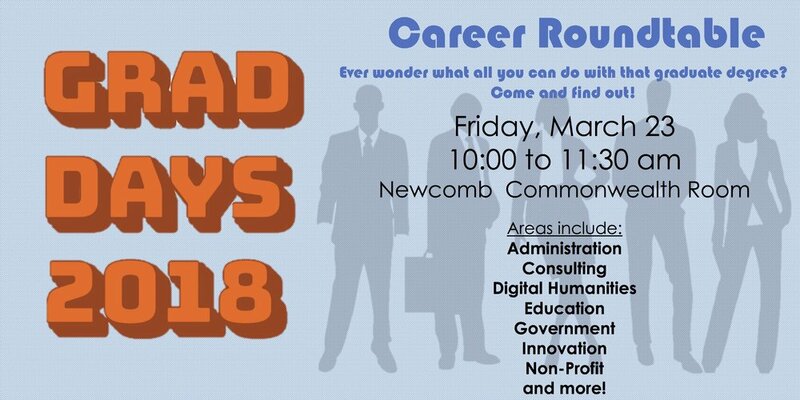 Professionals from a variety of career fields (including administration, innovation, non-profit, and industry) will come speak about their experiences and career trajectories. The event is designed for attendees to move from table to table to speak informally with representatives from various fields and professions. Join us to learn about variety of career pathways available to professionals and academics with graduate degrees. 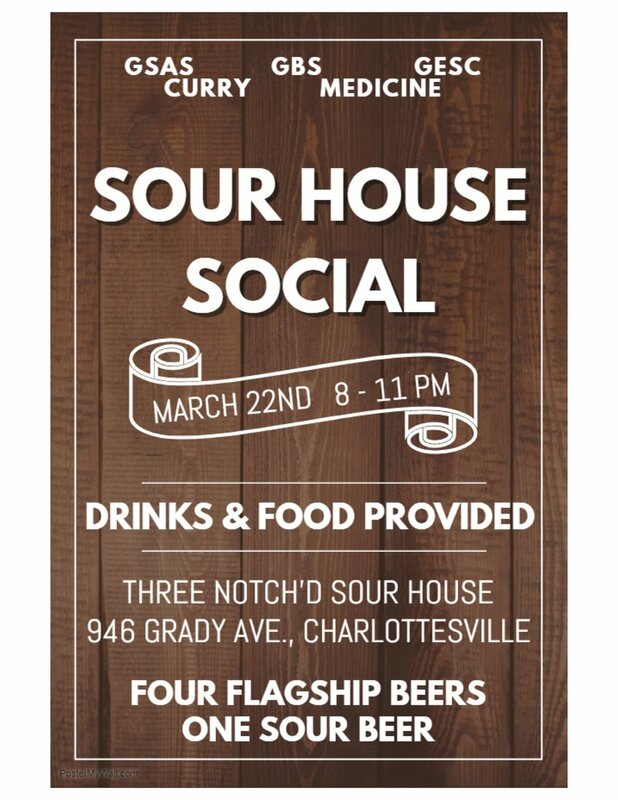 Join Grad Council, GBS, GESC, UVa Medicine, and the Curry School at Three Notch'd (@ Sourhouse location) for a beer and social event*. *Please bring a government issued ID. We've invited representatives from various centers and offices across grounds to provide graduate students with knowledge of the resources they have access to as members of the UVA community. Come hear from the Center for Teaching Excellence, the Office of Graduate and Postdoctoral Affairs, Counseling and Psychological Services, Research Data Services, the UVA library and more about opportunities and resources available to graduate students. To attend the University of Virginia Engineering Research Symposium Research Communication Lunch, sign up here. Find more information about the event here! Join Grad Council for coffee and breakfast at OpenGrounds (located at 1400 University Avenue on the corner). We'll be documenting 20 second videos of UVa graduate students and your research interests and sharing these brief research profiles via Twitter. We invite you to share your research focuses in video format, or simply join us for snacks and socializing! Join us for a free yoga session at AFC. Sign up here! Join Grad Council at Davenport Field at we cheer on the UVA Baseball team against Towson! We'll meet at the Hillside starting at 3:45pm inside the stadium (game starts at 4pm). Grad Council members will be sporting navy blue GSASC t-shirts. 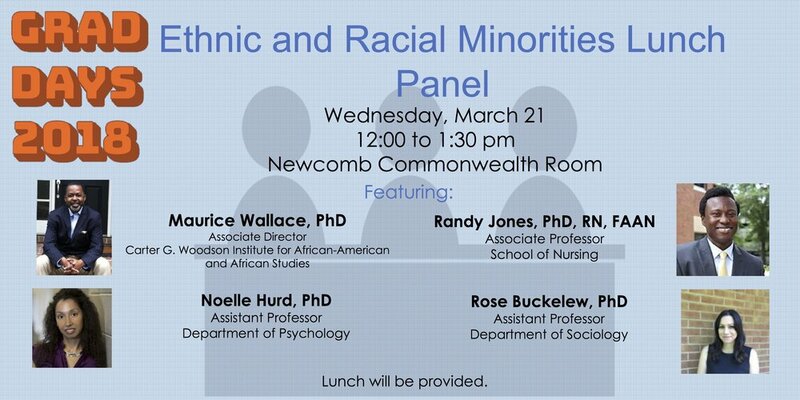 Grad Council is hosting a panel of UVA ethnic and racial minority faculty and staff from various disciplines, departments, and offices for a lunchtime discussion to discuss their personal experiences and any obstacles they've faced navigating academia and the job market. After a brief introduction of speakers and prepared questions from a moderator, we will open the room for a series of informal questions and conversation. The School of Nursing will provide 2 hours of relaxation for graduate students across grounds! Sign up here! Massages rescheduled. Following the annual Huskey Research exhibition, join us for a wine and cheese event at the Colonnade Club to celebrate the achievements of our Huskey graduate student award winners and participants. Grad Council's annual Huskey Research Exhibition unites graduate students across disciplines and departments as they present their research to the broader UVA community. Oral presentations take place 1:30-3:30, and poster presentations take place 3:45-4:45pm. President Teresa A. Sullivan will give Huskey's keynote address at 5:00pm. Join us and hear more about the innovative research taking place at UVA! Join the Scholars' Lab for a workshop on visual thinking and a panel titled "Diss-entangling from the Monograph: A Non-traditional Dissertations Panel." Grad Council invites you to take advantage of free professional headshot photographs! Sign up here!